In a letter published Tuesday, the Australian leader asked the G20 summit host, Japanese Prime Minister Shinzo Abe, that the issue be raised when leaders gather in Osaka this June. 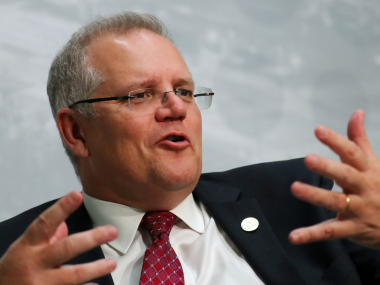 Morrison is in the middle of a tough re-election campaign, where his party has faced persistent allegations of fuelling anti-migrant sentiment to appeal to conservative voters. Morrison has spoken publicly several times to denounce extremism since the attack that killed 50 people in neighbouring New Zealand on Friday. He has also taken aim at tech companies for their seeming inability to stop the propagation of extremist content, such as live footage shot by the gunman as he rampaged through the Al Noor mosque. "They've created these capabilities, and in the overwhelming majority of cases, they're available for peaceful and happy purposes, but we do know that they can be used and weaponised by terrorists of any description," he told the press. "If you can write an algorithm to make sure that the ads they want you to see can appear on your mobile phone, then I'm quite confident they can write an algorithm to screen out hate content on social media platforms. "I'm sure we can work together to make sure they protect our citizens by ensuring that the tools that they have developed are not used by terrorists as weapons to advance their agendas of hate," he said. Opposition leader Bill Shorten backed that call, telling social media platforms: "If you help create the swamp, you can't go missing when evil things start crawling out of it."